Store and taproom now open at 489 Broadway in Saratoga Springs. You’ll wish you had thought of this business for downtown Saratoga Springs. But since you didn’t, just stop in and enjoy! 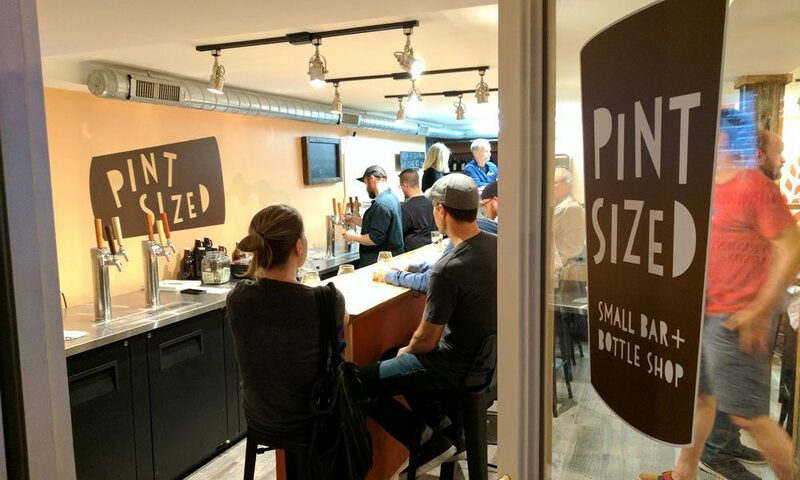 Pint Sized Small Bar and Bottle Shop at 489 Broadway is a great place to pause. This second location for owner August Rosa is not only a bottle shop like his Lark Street location in Albany, but it’s a cozy bar too. While the music plays, choose from 12 rotating draft beers on tap while Nico fills your growler to go. At a minimalist 600 square feet, which includes a bar with six stools, four bistro tables inside, and some outside seating for fair-weather days, you may have to wait a bit for a spot. But their coolers are packed with more than 100 craft beers, specialty bottles and barrel-aged brews that can be purchased to take home. Wine lovers are discovering sour beer styles including Wild Ales, Gose, Berliner and Weisse, to name a few. With promotions like Work-from-Bar specials that include half-price empanadas from noon to 4 p.m. Monday through Friday, Happy Hour every day from 4 p.m. to 8 p.m., and Late Night Happy Hour from 8 p.m. to midnight, the casual atmosphere accommodates everyone’s schedule.